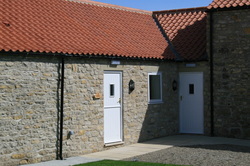 This is a single floor cottage and was originally where the working horses were stabled. Now a 2 Bedroomed cottage with stunning views and tastefully decorated throughout. There is a lounge/dining kitchen, 2 bedrooms and a bathroom. The lounge has a 32" flat screen tv with dvd player, there is a well equipped kitchen area with dishwasher, washer/dryer, fridge, oven and hob with microwave, toaster and kettle. The first bedroom has a double bed wardrobe, drawers, dressing table with stool and tv with dvd. The bathroom has a modern 3 pce bathroom set with bath and integral shower. There is a log burning stove and full oil fired central heating.